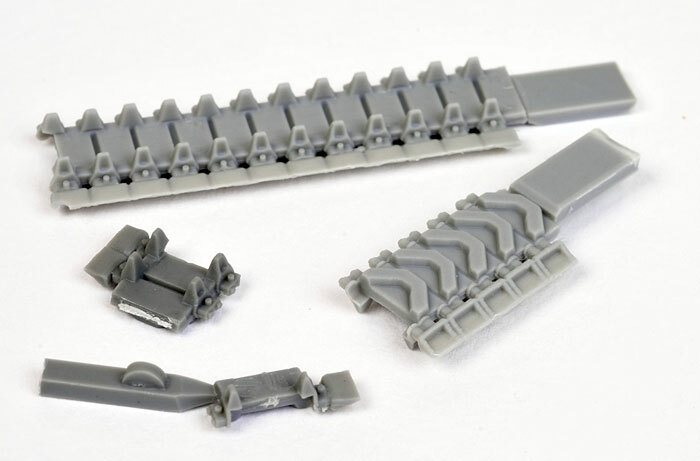 Advantages: NiceUseful variation of track type for M4 modellers (other styles also available); perfectly cast; excellent detail; minimal preparation required; same method of assembly as Tamiya's 1/48 scale trackes, i.e. - easy! 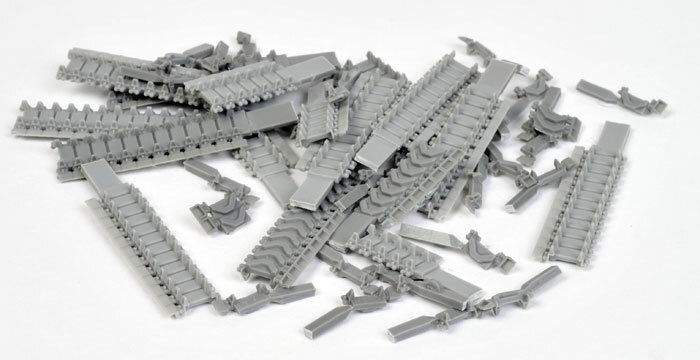 Fighting 48th has expanded its range of accessories to include a number of 1/48 scale M4 Sherman tracks. These are very useful and relevant options for Tamiya's M4 / M10 family of kits, and will also be suitable for M3 and M4 based models and conversions from other companies. The set under review here is the T48 track with Paddle End Connectors. This style of track reduced ground pressure and offered improved grip in muddy or snowy conditions. They were often seen fitted to the M4s and M10 family in the latter half of the war. 46 parts are supplied in grey resin. These are broken down in a similar manner to Tamiya's own plastic tracks, with various lengths comprising 12 links, 6 links, four links plus a number of individual links to wrap snugly around the drive sprocket and idler wheel. The parts are all cast perfectly and beautifully detailed. The end connectors are especially fine. I cannot see a single casting imperfection on my sample. Enough parts are included for either a standard M4 Sherman running gear, or the longer chassis of the M4A4 / Firefly VC. Cleanup is a snap - quite literally. The individual casting blocks can simply be snapped off the main track parts. A couple of the lengths on my sample have some feather-line flash, which should only take seconds to clean up with a hobby knife or even a stiff brush (I have an old toothbrush I use for this task). If you have already built a Tamiya 1/48 scale Sherman, you will have no trouble assembling these tracks. The method of construction is the same as the Tamiya kit tracks with the exception that you will need to use either super glue or a two-part epoxy adhesive to join the parts. Instructions are supplied on a double-sided A4 sheet, with ample text and images to guide even a first-time resin modeller through the assembly process. These are a very useful accessory for 1/48 scale Sherman fans. I know that I will be buying several more sets for various M4 projects.